Visitors are drawn to the islands of Zanzibar, “the Pearl of the Indian Ocean”, by the fascinating history and culture, the relaxed and exotic atmosphere, the pleasant climate, the pristine marine environment, the coral reefs, the big game fishing, the plantations of spice and tropical fruits, the fabulous foods of different origins and the unspoilt sandy beaches and crystal clear waters where swimming is possible throughout the year. There are direct international flights from Ethiopian Airlines, Kenya Airways, and South African Airways. In addition, nearby Dar es Salaam is also served by British Airways, KLM, Swiss Air, Emirates. Within the East Africa region local flights are also available from Air Tanzania, Precision Air, ZanAir and Coastal. 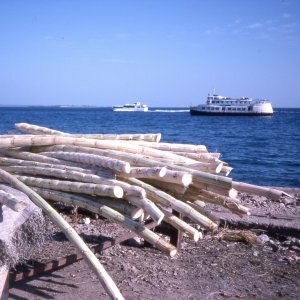 By sea, Zanzibar can be reached from Dar es Salaam by fast and regular ship service. Including Sea Bus 1-3 and Sea Star 1-2. Zanzibar lies 6° south of the equator, and consists of two large islands plus several smaller ones, about 40km (25 miles) off the coast of East Africa, in the Indian Ocean. The population of Zanzibar is a round 700,000 (1992 estimate). Zanzibar’s largest settlement is Zanzibar Town on Zanzibar Island (Unguja Island), with about 120,000 inhabitants. Most people live in small villages, and are engaged in farming or fishing. The monsoon winds that blow across the Indian Ocean have allowed contact between Persia, Arabia, India and the coast of East Africa (including the islands of Zanzibar) for over two thousand years. Portuguese navigators reached Zanzibar at the end of the 17th Century they and established a trading station. At the end of 17th Century they were ousted by Omani Arabs. During this period , Zanzibar became a major slaving centre. In 1840, the Omani Sultan Said moved his court from Muscat to Zanzibar, and the Island became an Arab state and an important centre of trade and politics in the region. Many European explorers, including Livingstone and Stanley, began their expedition into the interior of Africa from Zanzibar during second half of the 19th Century. Zanzibar was a British protectorate from 1890 until 1963, when the state gained independence. In 1964, the sultan and the government were overthrown in a revolution. In the same year, Zanzibar and the newly independent country of Tanganyika combined to form the United Republic of Tanzania. The best time to visit Zanzibar is June to February. The main rains fall from mind– March to mid-June. The average daily temperature is about 260 C. Sea breeze are enjoyed all over the Island and the average sunshine is 12 hours day. The language of Zanzibar is Swahili (called Kiswahili locally). English is widely used in the towns and tourist areas. Arabic is also spoken. Islam is the main religion, and practiced by most Zanzibaris. There are also small populations of Christians and Hindus. Zanzibar is a separate state within the United Republic of Tanzania has its own government and president. All original material © Sama Tours 2000-2009. Last modified: September 2009.